Suppose a photograph with text and numbers. I want to manage it in my editor with tools such as grep, standard text-processing things such as Vim's block-highlighting and also more advanced things such as Gimp's magic-wand-style pattern highlighting. How? For the sake of simplicity, suppose the writing is line-wise so you do not need to consider reprocessing multiple-lined documents. There is some working-prototype that does pretty good job in small scale with LaTex here, the multiple lined problem follows later. 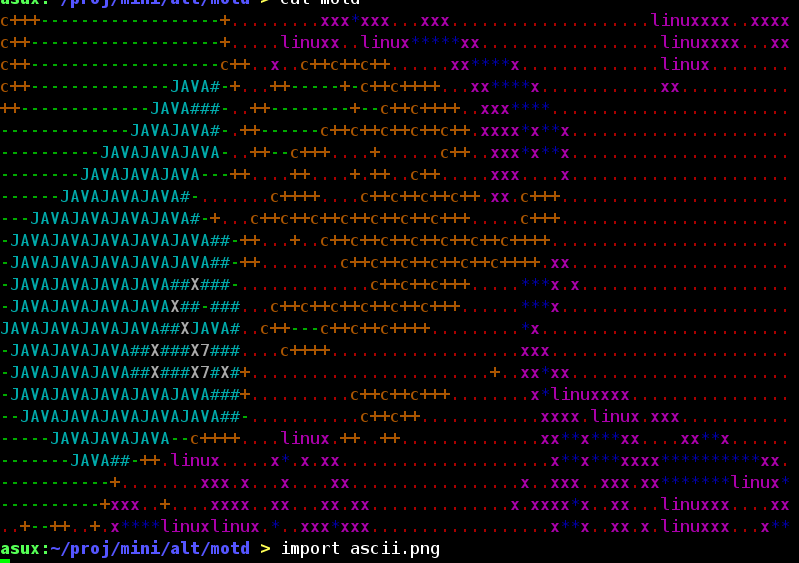 Beside OCR-Software, which was my first idea too, I think of libaa1 (ascii-art) and related programs. There is even a program to watch TV in ascii-art, ttv, so there will be an image transforming program, I'm pretty sure. And I remember a program in the ImageMagick package, where you can take a photograph of a flipchart, and it performs ocr on it. Unfortunately I don't remember the name and can't find it again - maybe it wasn't part of ImageMagick, but something else? In 2003, I produced this image: but unfortunately, I left no comment, how I produced it. Since I know the foto, where it origins from, it could be gimp-plugin too. Or I reduced the colors drastically to 4, 8 or 16 and reduced the resolution to something screen-friendly like 80x40, and worked with a programming language along the pixels, writing different characters for different colors, which I then wrapped with ANSI codes to produce the colors, and replaced signs with words. Maybe partly by hand, if I remember correctly. Generating file with ASCII numbers using /dev/urandom?